Post-sales process: manage tasks once you've closed a new deal! no crm.io is a lead management software, focused on leads. It aims at helping you close deals faster and at managing them in the most efficient way possible. With no CRM.io, you can optimize your sales process. Nevertheless, experience has shown us that once a lead changes to WON, i.e. a deal was successfully closed, often a project needs to be developed and there’s a great need to follow-up on that. Thus we have included a Post-Sales Process system in no crm.io. The Post-Sales Process system is very simple and is available on both the Starter Edition & the Expert Edition packages but with advanced features in the Expert Edition package. How to create a Post-Sales process? Once you've changed a lead's status to WON the system will ask you if you wish create a Post-Sales Process. 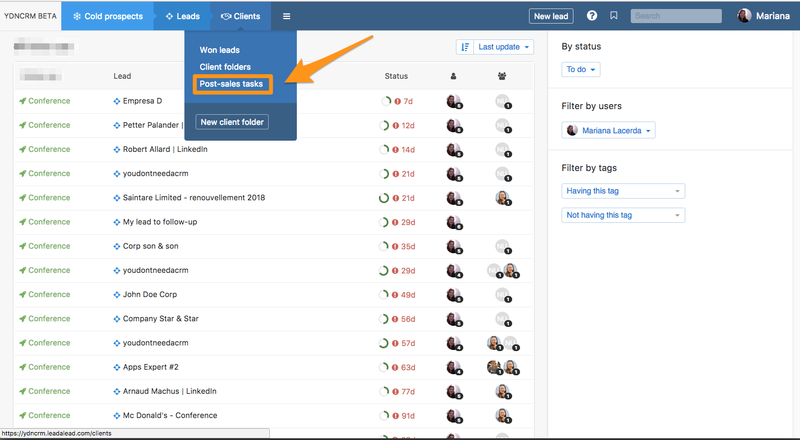 If you don't wish to do it right away, you will be able to add a lead to the Post-Sales Process at all times using the Actions button of the lead. The Post-Sales Process is a group of tasks that need to be handled after you've won a deal. And, since the process behind a sale is often the same, we've added the possibility of creating a template so that you don't have to create the same Post-Sales Process with the same tasks manually over and over again. To create templates, go to the Admin > Post-Sales Process templates section of your account. Each follow-up can have several tasks, which can also be predefined in the follow-up template. How to manage your Post-Sales Process? The Post-Sales Process system is available in the "Clients" section of your account. Just like for your leads, we will show the number of Post-Sales Process with active tasks; and if you have a Expert Edition, this number will also take into account the tasks you need to manage in other users' Post-Sales Processes. N.B: when you open a lead that has a Post-Sales Process, the details will be included in the lead's details, at the right. Also, when in the extended or compact mode, a rocket icon will be added to all the leads that have a Post-Sales Process attached. Once you've finished a task, easily change it's status to Done. If you're using the Expert Edition, you will be able to set a reminder for a task and leave it on standby until then. Just like leads, when the time comes you will be notified there's something you need to manage, and if you set a time to the reminder, it will also appear in your calendar. You can assign Post-Sales Processes to other users, but individual tasks can only be assigned to other users in the Expert Edition. In terms of privacy, note that when assigning a Post-Sales Process to someone, you will be granting them access to its corresponding lead.